The winner for Clayton Kershaw was always going to be a contender. As I’ve stated before and again. He’s almost guaranteed to be a value. I had him realistically rated as high as $150. Getting him for $117 hurts in some ways, but the team with a better name in the works, made out like bandits on a few auctions. Manny Machado is a star in this league. Edwin Encarnacion is a fantasy star, his defense doesn’t play here. Carlos Gonzalez is still in Colorado, and even if he was not, he’s still a near lock for top five in left field. 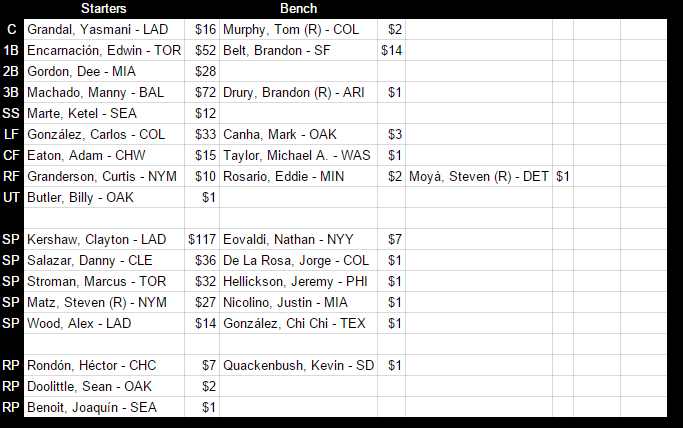 I’m higher on Adam Eaton and Curtis Granderson, lower on Ketel Marte and Dee Gordon. It will probably even out. Are we relying on Billy Butler to be a staple at the second utility spot here? Hmm. There is a lotto like about this line up, stealing Brandon Belt for $14 seems like a great buy, Keith Law probably still agrees. Kershaw is the best player in the league. Danny Salazar, Marcus Stroman and Steven Matz are all really good and interesting. I consider them all tier 2 pitchers, but if they all ended up in tier one at the end of the season I will not be surprised. I do not love Alex Wood, but between him and Nathan Eovaldi you have a solid number five and I’d be okay with Jorge De La Rosa as my sixth when he’s out of Colorado. Weeks when Kershaw pitches twice, there’s not many pitching staffs that will out-duel. He’s just so damn good. The bullpen may or may not hold this staff back. Hector Rondon has a lot of good outings, and some seriously bad ones. Joaquin Benoit is pitching in Seattle, but currently does not have a secured role. The depth here is set to be alright. The positional flexibility plays well here. There’s no backup 2b or SS here. How many plate appearances will be left on the cutting room floor, or only slightly better, left at replacement level. Probably too many. But that could be easily patched. There is a good chance a few of these guys become legit starters as well. May the good lord forbid, but if Kershaw gets hurt. I mean I don’t even know what else to write. For any team if 22% of their budget was hurt early in the season for the whole season they would be easy choice as sunk. Same problem lies here. For the sake of the argument say the young three guys behind him hold up the pitching staff. Well it gets bad if Gonzalez and Granderson under perform. If Edwin Encarnacion goes missing, or worse, Machado has knee issues.